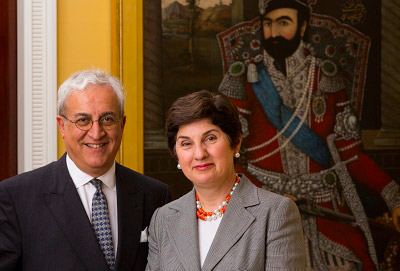 Princeton: A $10 million gift from two Princeton alumni will establish the Sharmin and Bijan Mossavar-Rahmani Center for Iran and Persian Gulf Studies at the University. Sharmin Mossavar-Rahmani, a member of the Class of 1980, and Bijan Mossavar-Rahmani, a member of the Class of 1974, have created the center to provide a comprehensive interdisciplinary approach to understanding Iran and the Persian Gulf, with special attention to the region's significance for the contemporary world. The couple, of New York City, grew up and completed their high school education in Iran before coming to, and eventually settling in, the United States. Each majored in economics at Princeton and earned a certificate in the Program in Near Eastern Studies. the Love for IRAN. We need more wealthy IRANIANS to follow their footsteps. Another Princeton graduate who served Iran. Thank you for the information about Baskerville.